Sydney and the central eastern coast of Australia were the only places Rick and Wendy visited. Unfortunately they had no time to visit “the Outback” nor the Great Barrier Reef off Queensland, which recently had been badly flooded by weeks of rain and then struck by Cyclone Yasi, supposedly a Category 5, comparable to Katrina. walk while being linked to a heavy wire along the route. Then they were clipped on to the wire to start their four-hour trek up and back. 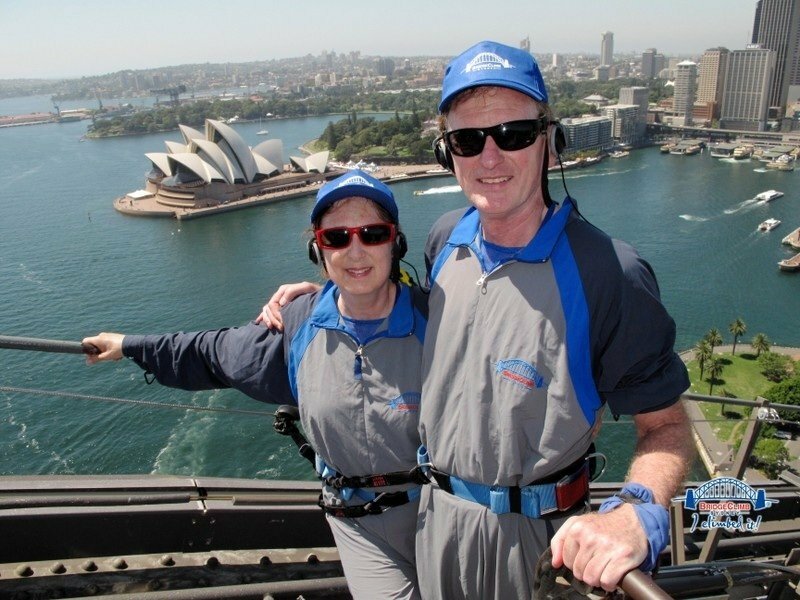 Yes, they climbed to the top of the arch, 134 meters above the water with a potential view of 70km in any direction. Though no one took their picture from below to prove it, they stood at the base of the flags along the top ridge, which were drooping for lack of wind on the day of their climb. 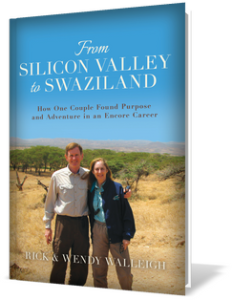 The Walleighs did pay for their pictures that were taken at the base of the arch as they were about to start the steep climb; near the top with a view of the Opera House; and as they crossed to head down the other side. This climb is not for the acrophobic nor budget-minded, but the fact that three tours per hour of up to 14 people, seven days per week, starting at dawn and going through early evening, should tell you how popular it is! After their bridge climb, Rick and Wendy lunched al fresco outside the 1846-built Oriental Hotel in “The Rocks” neighborhood which is home to a large artisan and farmers’ market every Sunday. The Sydney Opera House was supposed to take 2 years and about AU$7 million from start to finish. But the design had been approved based only on a sketch by Jorn Utson, a Danish architect, without real engineering thought behind it. More than 10 years and AU$103 million later, it was completed. However, despite delays, it was truly a gift to the country, eventually with caring thought behind every view and detail. For instance, the chevron tile pattern on the roof was copied from a dress which the architect’s wife had worn. With great vision, he integrated the adjacent Sydney Harbor so that it became part of as many interior walls as possible. Even the concrete, wooden and glass interior was to be sleek, simple, and very connected to the building exterior and outside landscape. Though Utson was fired and never returned to Sydney to complete the building even after he was re-hired and managed the completion from Denmark, the city dedicated a large meeting room in the opera house to honor him. The Opera House glows and changes color throughout the day. More than an icon of Sydney, its purpose is entertainment for the public. Also outside is a long promenade along the harbor with cafes. At the time of the Walleighs’ visit there was a huge inflatable exhibit livening up the neighborhood which attracted people to wander into the fantastical shapes. The city of Sydney beautifully integrates the ocean around it, much as the Opera House does the harbor. While there are still many Victorian-style buildings to indicate Australia’s British heritage, Sydney is a modern city that particularly built up its facilities when it hosted the 2000 Olympics, e.g., a monorail with several interesting-looking stations throughout downtown. The whimsical Macquarie building, seen from the harbor, is named for one of Sydney’s founders; the Maritime Museum resembles a ship’s prow; and colorful, older row-house neighborhoods make parts of the city feel cozy. Of course every harbor-side city has a commercial fish market which is active from dawn to early afternoon but empty by dinnertime. Sydney also has a huge botanical garden with native plants, sections with a few aboriginal names, and unfortunately a large group of Flying Foxes–aka a species of fruit bat–hanging from many trees. The city has been trying to remove the bats since they destroy the trees, then move on to new ones nearby. There are two wonderful zoos in Sydney. Wendy was determined to see a Duck-Billed Platypus exhibit which there was in the Sydney Wildlife Park (see NZ & Australia Animals page). Due to limited time, the Walleighs visited only the one zoo with the Platypus but this large facility also included many of Australia’s unique air, land and sea creatures. After Rick few back to CA, and while staying in Terrigal north of Sydney, Wendy accompanied her hosts and other friends back to Sydney to see a few places they hadn’t been able to tour the week before. They visited the Queen Victoria Building (QVB) renovated into an upscale mall but which kept the old world flavor with its hallways, lovely stained glass windows, and two huge, antique, mechanical clocks. Their hostess had worked in the Sydney Public Library after her university days, enjoying the city as many young people do. So she took Wendy and friends to see the library entrance with its floor consisting of an engraved marble map that colorfully showed the country’s very early history. The group also rode the harbor ferry. One of their ferry destinations was Manly Beach (named after a person, not a male characteristic) to see beach club water sports competitions, including young teens on paddleboards. On the way to Manly and back, they watched sailboats take on the challenge of the Sydney Harbor’s winds and currents. The pilot of one very colorful sailboat was too confident, heavily “tacking” the boat to soak up the wind. But as Wendy and friends watched, in slow motion the sailboat fell over, dropping all its passengers into the water. Amusing for the ferry passengers but highly embarrassing for these “manly” sailors.